How does Google+ Light Box widget Play a vital role in Blog ? As for as we know it play an important role in blogger blog. It will increase google plus friends, google plus pages likes and our loyal readers. It make a mutual relationship between your common friends with you on goggle plus profile. By mutual we mean that whenever we publish our post on google plus account it will inform all your common friends by sending a message. And this will be happened once you have dozens of friends with you on google plus. Now the question is arise how to increase the traffics of google fan page or profile page in short way. Therefore there is gadget in-front of you that we are gifting in this post. once you put in your blog you will be hugely say what an amazing gadget. Does Google Plus LightBox Compel the Blog on loading Time ? There are numerous features some of them are short listed in the below section. You will learn how this gadget is popular for blogger blog. Just try once to put this gadget in your blog. This a very simple methods you can easily add this gadget by following the below simple steps. follow the below steps correctly hope you will get the results. Hope guys you will love this simple google plus gadget. Since we have seen such alot of pro blogger which are still using such type of gadget. So we would strongly recommended if you are worried about your limited google plus friends then we are forcing you to put this gadget in your blog. It will borrow your google plus likes. Happy Blogging! This gadget is really Amazing that helps to increase our G+ followers. I also have shared this gadget on my blog. But dear do you know how we can restrict it for those who are already following us? Please let me know the solution. Thanks! Bro please give me your blog url. We will check what the problem. Second thing is that if you want to a live help. You may join us. we will talk to you on facebook. join us at. Amazing widget Hafeez Bro.. Keep it up. And also checkout our first widget "Socializer Widget". After all, Best of luck for success in blogging. 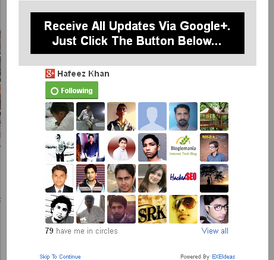 Amazing widget for increase google plus followers good job hafeez bro.. Thanks adrian brother for commenting here. we are happy to you once again. keep visiting us we will always get together. Thanks Asad for commenting here. You become a loyal reader of PBT. we always want to see you here. See you in my next widget tutorial. Bro you not have a label widget still in your blog. you have not insert that widget try to first insert that in your blog. that is really amazing widget. How to create a blog in blogger.com? You are welcome bro. Thanks Jamshaid for encouraging us. keep visiting us for latest update. I want it opens once.When I click post link it appears everytime and I think it is annoying.what is your solution for this? Yes... same problem .. its showing every time ..
me need better solution for this ..
Amazing Widget, i really liked it .. really helpful. It increased my Google+ Followers from 10 to 82 in 2 days .. Thank You so Much .!! thank you so much for this useful post ..
how to stop this .. is any option there will show inly single time ..
i seen as much as time i visit its showing & showing ..